So pretty!! Still drool worthy too! Hope all is well with you, @petit_bijou ! This gem is just perfect. . I simply have no words for it. Bumping this up. Still the nicest lavender I've seen. I come back to this post to admire a work of art. Wow. Yup. Most incredible blue spinel I've seen on PS. Or, really, spinel of any color -- this exact color is my (unattainable) dream. Hope it is being loved and worn and loved some more!! Oh wow, I haven't been on PS in ages but so nice to see activity on this old post! The stone is still in it's original setting, and I wear it only around the house or for special occasions as the head of the setting is a bit tilted and I can't tell if it's my imagination that it's getting worse, or if I'm just freaked out. I've been putting off getting it looked at/fixed since we do still plan to have it reset. I am learning towards a EW Margot solitaire for it, since the 8 prongs would protect it nicely and I love the delicate details of her work. The swoopy basket also echoes a channel set diamond half eternity I have been wearing with my plain wedding band where the sides of the band carved to look like baby bezels (I'll find a picture to post). MissyBeaucoup, Lykame, AceofHearts and 2 others like this. I know it doesn't show the stone, but this is what I've been wearing daily... you can kind of see the detail on the sides of the diamond band and how it would "match" the details on the setting I have in mind. I sometimes stack all 3, but find that it loses the delicacy since my current solitaire has such a wide band, so when I wear the spinel I'll choose one of the bands depending on what I'm doing. JrJ, MissyBeaucoup, Lykame and 11 others like this. Your new setting idea is gorgeous! Do you have any current pictures of the lavender? I love, love, love the color. MissyBeaucoup and petit_bijou like this. MissyBeaucoup, petit_bijou and elle_71125 like this. Your stone is one of my all time favorites! I love it in its current setting and also think it would look amazing in the Margot setting. 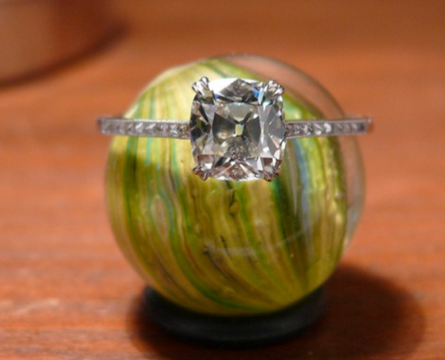 I don’t think there could be a wrong setting choice for such a beautiful stone. @evergreen I'm so glad I'm not the only one! I admire it every day and sometimes wear it around the house, but I'm always a bit scared. Thank you @suzanne2 @arkieb1 and @2Neezers I still feel so lucky to have it! MissyBeaucoup, evergreen, NKOTB and 2 others like this. I love your setting idea! Thanks for sharing.